I know, it seems like it should be simple. Hop on the seat and let the driver do the rest, right? Easy peasy lemon squeezy. But after seeing another Haitian moto driver pancaked under an American passenger in a minor accident and hearing the throngs of chauffers singing in unison “White people just don’t know how to ride motorcycles,” I decided it was time to write a post informing visitors to this country how to ride a motorcycle. It’s actually more complicated than most people expect. So here’s a few do’s and don’ts for you before you get on the back of a moto in this country. Let go of any and all sense of boundaries and personal space. As soon as you know you’ll be riding a motorcycle in Haiti you have to immediately become best friends with both your driver and your other passenger(s). They will be in your lap or you will be in theirs soon enough. By the end of the ride you will feel closer to the others on the moto than you might to your significant other waiting at home. You may know more about them than you care to without even ever having to say a word. It’s also quite possible that you will either end up pregnant or sterile by the end of the ride, but hey, what’s life without a little risk, amirite? Get on the moto from the left side. This will decrease your chances of getting a burn from the muffler. Scootch up when going uphill. Don’t worry about how inappropriate it feels to be thrusting your pelvis into your driver’s backside, it will help the moto climb the incline. Scootch back when going downhill. True, you will probably just slide right back forward again, but sometimes it really is the thought that counts. Keep your cargo centered. If you are carrying a backpack, bag, or anything else, do your best to keep it as centered as possible as to not affect the balance and don’t hold anything in such a way that it would be in the way of the driver’s elbows or legs if he has to move them quickly for steering, shifting gears, or braking. Expect a breakdown. A flat tire, a broken chain, a loose nut, a faulty brake, an empty gas tank. It’s going to happen. Just roll with it. Pay your driver sufficiently. Realize that American passengers are denser than the average Haitian passenger that they’re used to and we’re also needier and more fragile and we are constantly asking them to stop so we can take pictures, so they have to drive us differently. 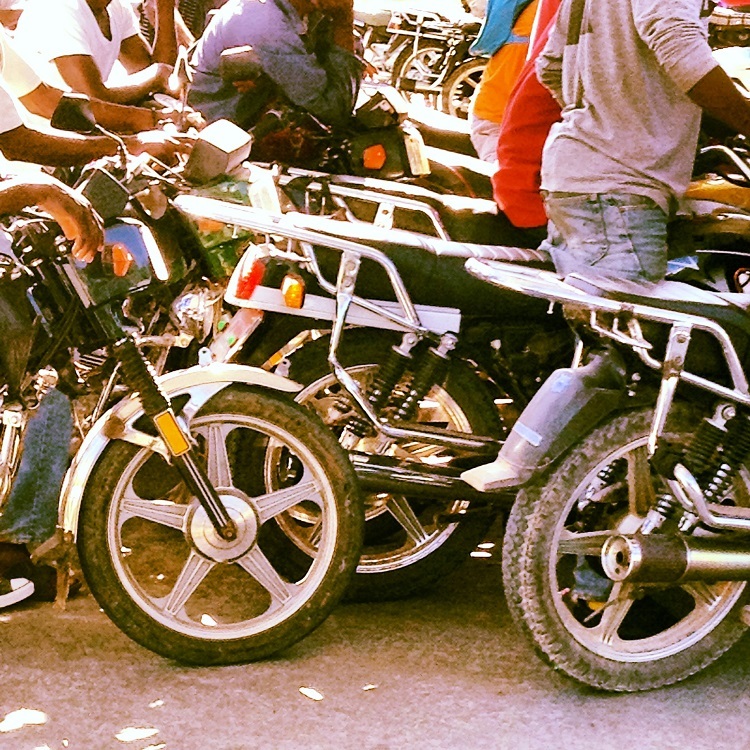 And there’s no more tightly knit brotherhood than that of Haitian moto drivers, so if you get on the bad side of one for underpaying, it will have widespread consequences. Panic. Even if you feel a crash coming on, don’t freak out, it will only make things worse. Don’t every try to grab your driver’s arms and don’t even try to put your feet down. These things can throw the moto more off balance still and can complicate the efforts that the driver might be able to make to lesson the effect of the impact. If you have enough experience riding motorcycles in Haiti you might be able to predict an accident early enough to jump off in time and improve things, but if you’re a novice at moto riding, it’s better to just sit where you are and let your driver do what he can to prevent you from being splattered on the cement. Hate the driver even if an accident does happen. It’s Haiti. Even with the best drivers, accidents happen. The roads are no good, weather conditions are always unpredictable, the other drivers on the road are even less predictable still, mechanical problems are the norm, and on and on. Hold on to the driver or to the motorcycle. This one is especially difficult to adapt to. It seems natural that the place to hold on to for a middle passenger would be around the waist of the driver and on the back iron rack for a back passenger. But it’s actually more appropriate for both passengers to simply keep their hands on their knees. It keeps everything on the moto on balance better and it also sets you up better if you do have to jump ship so you don’t make things worse for others on the moto. Try to fix the moto if it does break down. They’ve developed techniques here that you’d never dream of using in a repair shop back home. Pretend you’re on a roller coaster. It won’t help and you’ll look stupid with your arms in the air screaming. Try to tell the driver how to do his job. He won’t tell you how to do yours. So there you have it. Are there any pointers that I forgot? Please add your own advice on foreign motorcycle travel in the comments below or your personal stories of crazy rides. And remember, any scars you bear from your moto accidents are just proof of the blood you’ve spilt in the name of helping your fellow man on this earth. Bear them with pride and share the stories that come with them. ← Dear Chikungunya: I hate you.